When I first heard the Gospel and believed, I knew I was washed clean and forgiven. But I didn’t have anyone who really understood the full and complete Gospel to disciple me. Nor did my husband. We had just come out of the Catholic system and were on our second or third seekermergent church (hey, we liked the music! ), when the Lord graciously opened our eyes to the Scriptures and the truth of who He is – and who we aren’t! Still, without proper discipleship, we got caught up in all the glitz and programs of today’s celebrity-driven church “bible” studies. The ones that told me if I just did these 12 things, or adopted these 7 habits, my life would be so much better. I’d be more organized/joyful/tolerant/smart/generous/relaxed, and less angry/sad/busy/ignorant/unloving/greedy/anxious. I’m about to share a book review on just one of the many church studies out there that really aren’t Bible studies at all. It’s one of many books failing to make a clear distinction between the doctrines of Law and the Gospel, which promises the forgiveness of sins in light of the person and work of Jesus Christ. Like everyone else, I thought that the celebrity writers of these bright, flowery studies were biblical. They certainly contained some familiar Bible verses and talked about God – and sometimes Jesus. But the narrative almost always seemed to point to the author, and her life, and her countless anecdotes about her kids, her husband, her failings, and her overcomings. These anecdotes were a highly entertaining path for me. Not toward confession and repentance from my disobedience, but toward legalism and rigid actions which ultimately would lead me to “feel” closer to God. OK, as always begin with the language that is being presented and carefully scrutinize it, and then compare it to the bible. First, the impetus of the book worrisome. A kid called them ‘rich’ so they changed their life? Were they ashamed to be called rich by a poor child? Guilty of the blessings God had sent them? If they were prosperous in contrast to a poor kid, then it was an opportunity to do more with their means. It is not a sin to be rich, even by comparison to others. Abraham was wealthy. So was Job. David. Solomon. Nicodemus. Joseph of Arithamea. Joanna the wife of Chuza, the manager of Herod’s household, and Susanna; helped Jesus out of their own means. (Luke 8:3). It is the love of money that rots. Was this family loving money too much? Or just ashamed of what they had? There is a difference. If they were attempting to shepherd their means in more Godly fashion, then that is fine. But it seemed that they were ashamed of their status in life. The bible has much to say about money, Godly living, shepherding resources, and excess, yet they did not consult with the word. They are off to a bad start. What was their source for proceeding? They created a man-made outline to guide their behavior rather than consult the bible. By what standards did they decide on seven? On food, clothing, spending? What about giving? Stress? Stress is part of life. Ask Paul. Peter. Stephen. Any martyr. Any Christian. We are at war with the powers and principalities of this world, and that is stressful. Do they think they deserve a stress-free life? What was the source of their stress? If they had made unGodly decisions about work, to the expense of their children, that is one matter. If they simply want the ‘good life’ that is another. Achieving it by man-made means and monastic ‘simplicity’ is not the way. We have had a wave of these try harder “faith” type books these last couple of years. 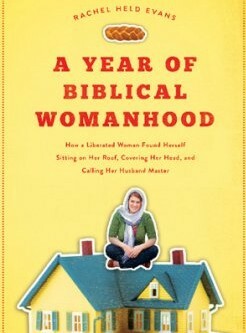 We suffered through Year of Living Biblically by AJ Jacobs and A Year of Biblical Womanhood Rachel Held Evans. In my opinion, this current wave of ‘do something, try harder, strip away the consumerism so we can get close to God’ kind of books began with David Platt’s “Radical: Taking Back Your Faith from the American Dream.” That was a book that made it seem like those who were not doing big and bold things for God and coming home after work to sit on their American couch were second rate. “You might remember I talked about the time when David Platt’s book Radical: Taking Back Your Faith from the American Dream came out. Christians all over the place got on the bandwagon and decided that their plain-jane faith was unremarkable and they needed an adrenaline shot of daring and a radical change to prove to God that they’re really a Christian who means it. Let’s contrast the fancy lights and high volume indoctrination of charismatic faith preached at Passion 2013 with this-” and I linked to John MacArthur’s posting of an essay called “An Unremarkable Faith“(written by Tommy Clayton). Are we to seek a radically better existence for ourselves on this earth? It is not our home. It is our battleground. Are we to seek a radically better existence for others on this earth through experiments like social gospel? No. Better their book be titled “An Experimental Mutiny Against Sin“ because that is what Christians are called to do, witness for Christ against sin and Him alone as the way to overcome it. I sidetracked about the Jacobs, Evans, and Platt books because I wanted you to see how these things are connected in waves. Platt’s book was seminal and damaging. We see that now. Back to An Experimental Mutiny Against Excess. The blurb says the family discovered that once they dispensed with their stuff, they found “a greatly increased God”? So, God ‘increases’ if we recycle? People, God doesn’t change depending on what WE do. 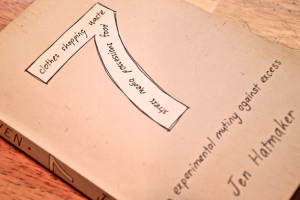 The phrase in the blurb says it all: “a social experiment turned spiritual was born”. They didn’t consult the bible and adopt biblical standards in repentance and to seek God, they performed legalistic and rigid actions and a byproduct of that was that their own experience seemed to bring them closer to God. It’s backwards. That is how one knows they are false. Now, let’s see what the bible has to say about riches. Now Abram was very rich in livestock, in silver, and in gold. And he journeyed on from theNegeb as far as Bethel to the place where his tent had been at the beginning, between Bethel and Ai, to the place where he had made an altar at the first. And there Abram called upon the name of the Lord. (Gen 13:2-4). BAH HA HA HA — stupid, eh? Now, it is not stupid to shepherd your means wisely. It is not stupid to care for the poor. It is not stupid to have compassion on those less fortunate. All those things are good. We are reminded of the Parable of the Talents (Matthew 25:14-30). Some people are richer than others and that is the way God set it up (Matthew 25:15). It is what we do with what we have that He is looking for. (Matthew 24:28). How we go about witnessing for Jesus regarding those important topics is what matters. How we share our means is what is at stake. Is what we are doing for the right reasons and done in the right way? Because there are right and wrong reasons and a right and a wrong way, as the parable shows. In the next part of this book review, I’ll explore what the reference in the book’s “seven sacred pauses” means. The meat of the problem with the book “7: An experimental Mutiny Against Excess” is contained in that phrase, and I’ll explicitly tell you why this ‘discipline’ is very, very bad. Is what we are doing for the cause of Christ Godly and deep, grounded in His word? Or is what we are doing for the cause of Christ superficial and wrong headed, off track and thus of the kingdom of darkness? This book is in the latter group and in the next part I’ll clearly show you how they went about it in the wrong way, and thus why the book is to be avoided. Complementarian John Piper shares teaching duties with a woman?